You know how it is……. things get busy , you don’t have your hair cut for a while. Then you can’t do a thing with it and every day becomes a Bad Hair Day. 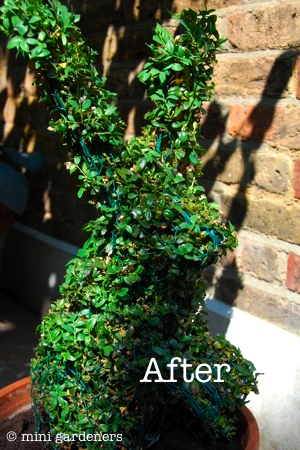 After a quick trim this afternoon our topiary rabbit can now hold his head up high and Bad Hair Days are a thing of the past. We also gave him a long overdue feed. 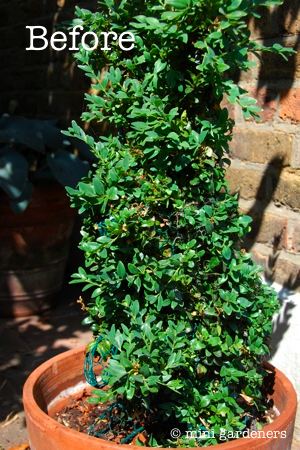 He’s about 3 years old and the plant inside the frame – box (Buxus sempervirens) – is filling out nicely. Categories: lifestyle, plants for children, projects, uncategorized | Tags: children, family, gardening, rabbit, topiary | Permalink.